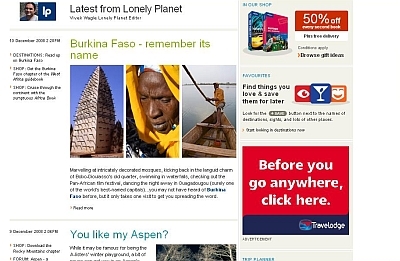 Anyone had time to check out Lonely Planet’s recent online makeover? Apparently LP ditched it’s old, clunky design featuring limited helpful information and loads of self-promoting ads for a clunky, blog-style site featuring limited helpful information and loads of self-promoting ads. I use Lonely Planet guides as much as the next guy when I travel, but you’d think a publication so aimed at young, savvy travelers would do a little better with their online presence. Any thoughts? Does anyone even really use LonelyPlanet.com for any reason other than for the Thorn Tree Forum?